The fine dining scene in Malaysia has grown leaps and bounds over the years. Back then, it was all about white table linens with a stiff atmosphere to boot. These days, many modern restaurants are adopting a more casual approach when it comes to fine dining and doing away with all the bells and whistles. Entier is one such establishment that ensures everything in its space serves a purpose. 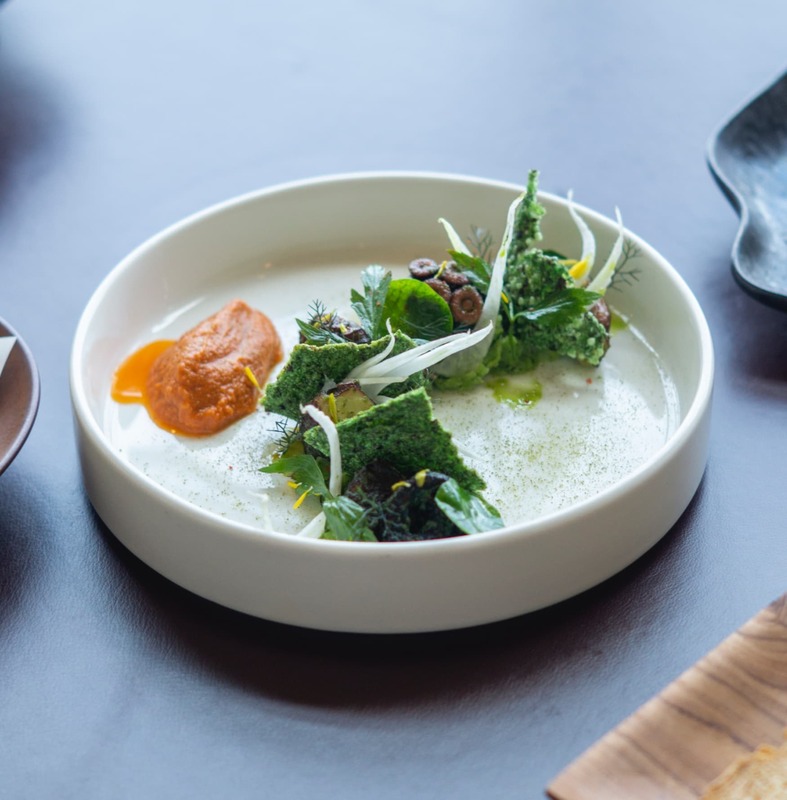 Having been in the scene for a year now, Entier has always been about its nose-to-tail eating in Kuala Lumpur, which mainly talks about sustainable dining. Located on the 41st floor at Alila Bangsar, Entier embraces its spirit of communal dining with a sharing concept, ensuring that nothing goes to waste. With this, chef Masashi brings out new additions to this season’s dinner menu. 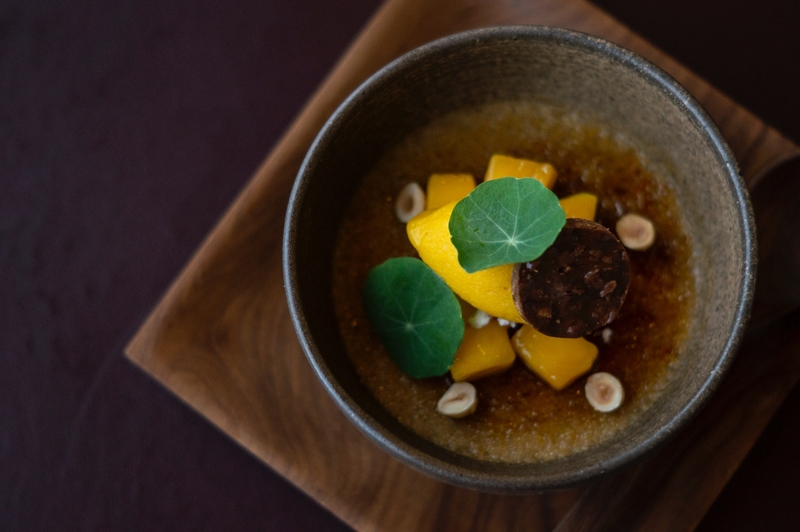 He introduces seven new dishes into Entier’s repertoire, all of which are locally sourced in the Malaysian terroir as well as the surrounding regions. This entails with a tale of its own that connects people to their food while also ensuring that the quality is still is immaculate. Chef Masashi also ensures that each dish has its very own story to tell, from its place of origin down to what one can expect from it. Fret not as Entier still keeps many of its favourites on the menu, which includes its josper-grilled Australian black Angus t-bone steak as well as its dark chocolate souffle. Scroll on down to check out some of our favourites from the latest dishes Entier has to offer for this season on its new dinner menu. 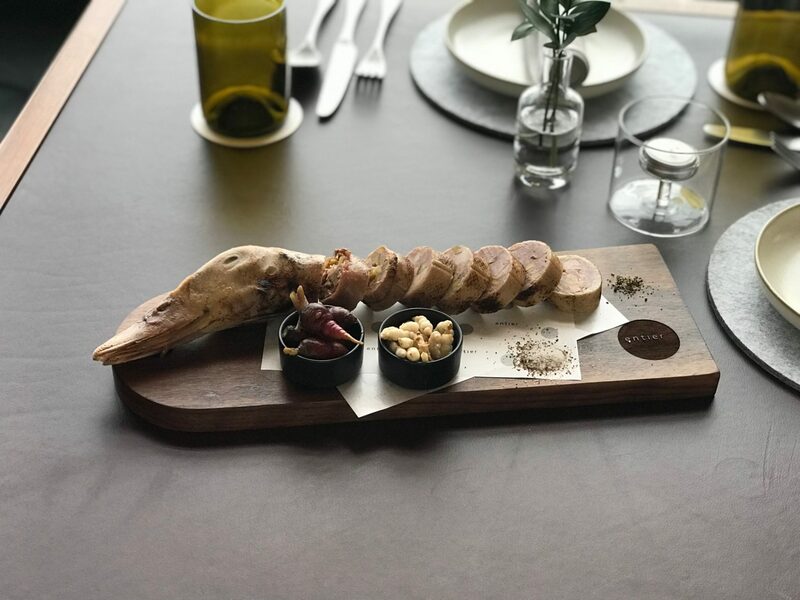 Pate is a popular dish that can be found in the Bordeaux region of France and with Entier being a French casual fine dining, it’s no surprise to see it on the new menu. However, this is where things get interesting as Entier utilises the neck and head of the duck for an evening of pate-stuffed delightfulness. Certainly not a dish for the unadventurous and conservative, Entier rendition of the Southwestern French delicacy known as Cou de Canard (stuffed duck neck) uses Bidor duck from Ipoh for its superior meat quality as well as its tender aroma. The duck head pate features breast and thigh meat alongside duck foie gras, which creates a delightful sensation on one’s palette from the first bite. It is also stuffed with various organic highland vegetable pickles, apricots, and pistachios, which perfectly tie the dish together into something so simple, yet soft and buttery the moment it touches the tongue. The next starter is Crab and Entier’s very own twist to a traditional French dish that’s enjoyed with fresh mayonnaise or aioli. Once again, the plating for its poultry + seafood portion of the menu is eye-catching with the entire dish being served on a whole crab shell resting on a bed of ice to keep it cool. 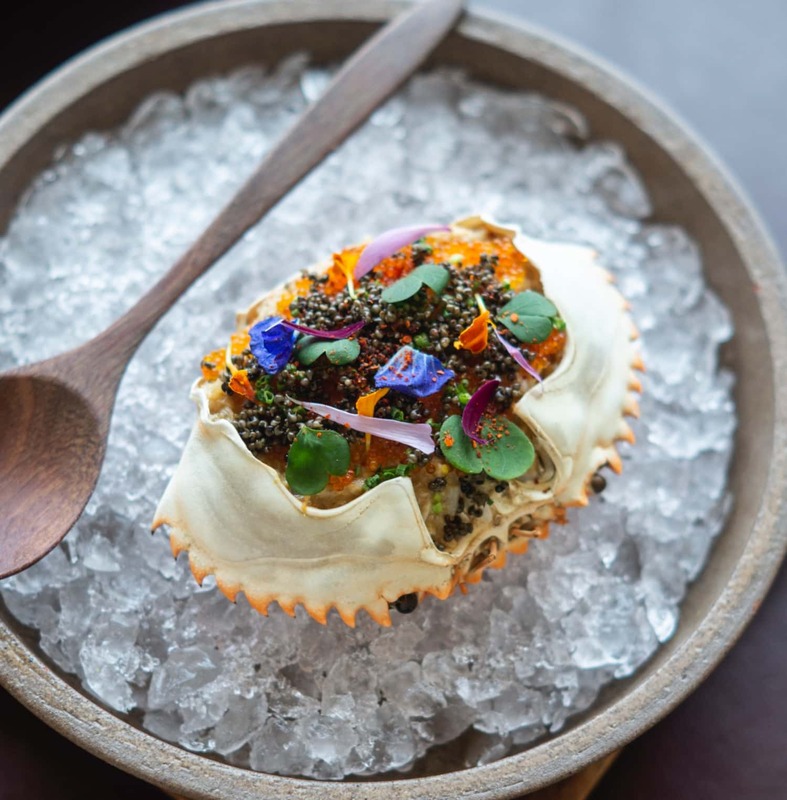 Entier takes the dish to another level by pairing the sweetness of the Indonesian mud crab’s silky flesh with the contrasting crunchy consistency of the tobiko and Tonburi ‘mountain caviar’. This marriage of flavours from both the sea and the mountain makes for an interesting combination. The mud crab is sweet yet light while the tobiko as well as the Tonburi are exceptionally strong in flavour and aroma — leaving you yearning for another bite. Another addition to the poultry + seafood portion of the menu is the octopus. The main ingredient — caught off the coast of Taiwan — is much more tender and of better quality as compared to the popular Spanish ones. The octopus is poached in black tea for hours, which is then paired with a smooth burgundy garlic butter to complement its rather overwhelming flavour. On the side sits a healthy dosage of romesco sauce to bring the entire dish together alongside seaweed crackers and smashed basil potatoes. The end result is an enhanced taste and texture of the octopus, which works surprisingly well with the rest of the ingredients on the dish. The octopus has a nice bite yet easy on the flavour while the burgundy garlic butter keeps it balanced in all aspects. 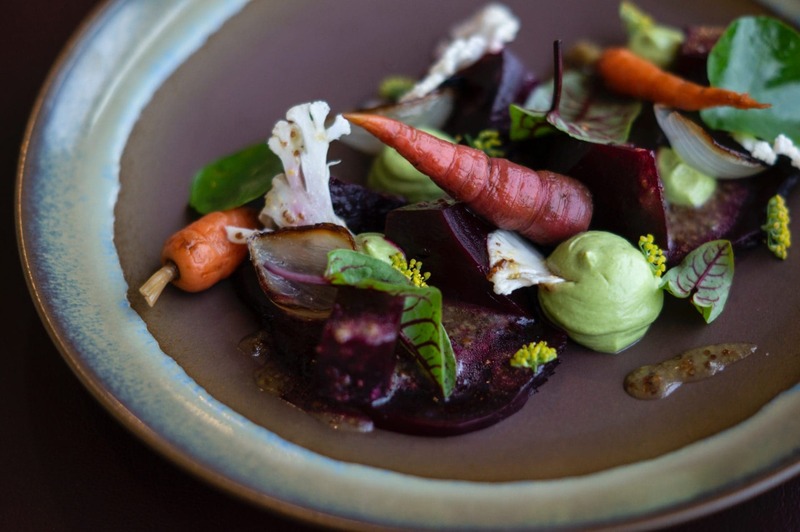 One of the best examples when it comes to sustainable dining is in the form of the beetroot salad in the vegetable section of Entier’s refreshed menu. The dish itself was inspired by famed chef Michel Bras during a recent guest chef event in Langkawi, Malaysia. There, he served his famed Gargouillou, which is usually prepared with 50 to 60 varieties of vegetables. Chef Masashi decided to create a beetroot salad dish where all of the organic vegetables are picked from the farms in Cameron Highlands. Overall, the dish is playful, light, and colourful with a combination of 50 vegetables used in different aspects. The beetroot is Josper oven-baked and paired with an organic salad, organic highland vegetable pickles, and char-grilled onions. The mixture of different vegetables, all with different tastes and textures make for an amazing bite and they all complement one another perfectly with the help of the dijon mustard vinaigrette. The chicken is considered to be one of Entier’s signature dishes, and with good reason. Made for sharing, the chicken is served as a whole and has since be re-conceptualised for this season’s menu. 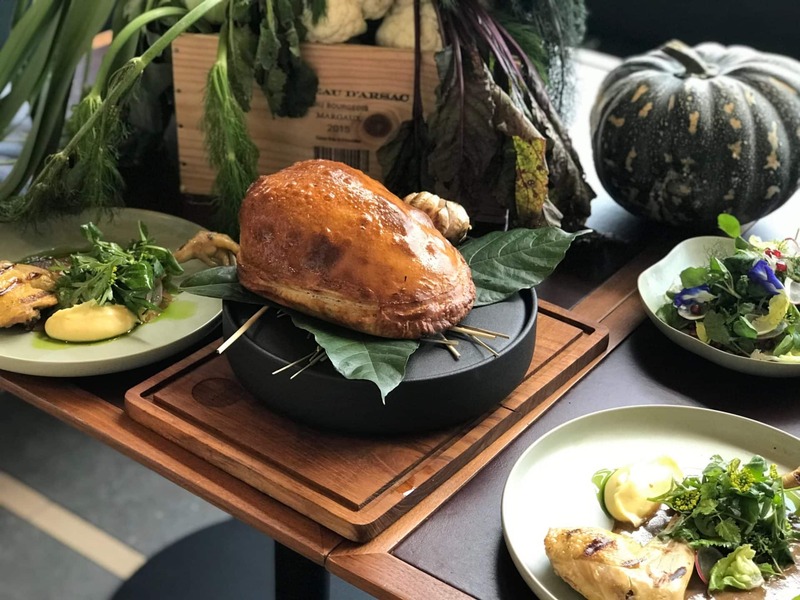 The previous iteration saw the entire chicken being roasted in a salt-crusted dough; this time, chef Masashi uses the Anxin Chicken where its breast is roasted with black truffle within the salt-crusted dough. The legs of the chicken is then done confit-style; this ensures all parts are used to its fullest potential. While chicken breast is known to carry very little flavour, its roasting with black truffle gives it a newly distinctive aroma and taste. The whole bird carries the unmistakably strong fragrance of black truffle. As for the confit leg, its juicy and tender meat goes well with the mashed potato that incorporates the chicken fat, which further pushes the boundaries of Entier’s sustainable way of dining.